This years event is looking to easily surpass last years. You wont want to miss it! Details to be revealed soon. Which of you are attending this year? KITT and I will be there Neil. Be sure to see The Hasselhoff's this Sunday!!! I like that KARR is on the poster! I also saw hidden artwork of each car in the windshields of each car on the poster when I visited the festival site! Oh, man! I can't wait! Think I may be attending a heavyweight title fight instead which sadly may be on around the same time. Skav wrote: Think I may be attending a heavyweight title fight instead which sadly may be on around the same time. I wrote my last post from my iphone and was in a rush so apologies for not being clear. If it's on at the same weekend or the weekend before or after then yeah. I just came back from Vegas, today, actually, and live in the UK so it all still depends on funds. I did some impulse shopping that I did not expect. So, woopsy. Blame them 50% off deals they got going there! If it's in April or May then I will most likely choose the fight because I can't afford to attend both. I am confident there will be a KRF IV even though these things can halt at any time! Big news and announcements coming regarding Knight Rider Festival III in the weeks to come. The cars are "back in black" to electrify Fremont Street in a spectacular new way and soon you'll be seeing just what we have in store for you March, 18-19th 2011. Make your arrangements now and get ready to join the celebration one more time as we present to you the greatest Knight Rider event yet while making a difference in the lives of sick children who desperately need heroes to believe in. You can make a difference by caring about things greater than yourself, by choosing to care, choosing to make a difference by supporting the event and its cause to help the innocent, the helpless, the powerless smile just one more day. History returns to Las Vegas. Will you be there to experience it? This quite possibly may be the last time we fans will have our own epic event in Vegas to celebrate our passion for Knight Rider. Don't wait for "the next one". You never know what surprises may appear and only those who chose to attend get to experience true history in the making. 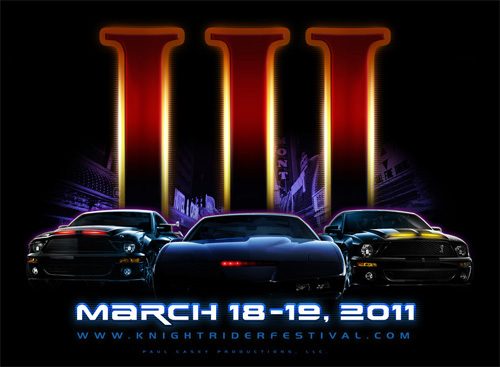 Victor Kros wrote: Big news and announcements coming regarding Knight Rider Festival III in the weeks to come. The cars are "back in black" to electrify Fremont Street in a spectacular new way and soon you'll be seeing just what we have in store for you March, 18-19th 2011.
what do you mean that this quite possibly maybe the last time so celebrate this festival in vegas this year comming up?? Exactly what it sounds like. Treat every event as if it's the last because you never know when it will end. This whole "I will wait for the next one" mentality is an excuse. By the time you decide that it is "the next one", the event will be over. Enjoy your first piece of cake before you ask for more. Apologies but I won't make it next year due to funds and the fact that I was in Vegas only two weeks ago and the novelty has worn off for a while. Hope everybody has a fun time! Well I will definitely be there! Spend my days working hard on logos, but the wheels on the clock keep spinnin' too slow...time is fast approaching for KRF III and it's getting closer in sight. I would be delighted if I could come, but ... BUT ... I'M SCARED OF FLYING! I've often looked at the other two KR Festival posters ... But I'm absolutely not go into a plane! That is really stupid?! And I live in The Netherlands! So if I go, I must with the plane to Vegas! But I don't do it! I'm very sorry, but I do not be there! Everything about Knight Rider!!! Take a look! You better be there, Slade! Had a lot of fun hanging out with you last year!